Over the past couple of weeks, I, along with millions of these shores have had the opportunity to remember those who were killed or injured in the service of their country. Luckily for me, I had another opportunity to march with my late father’s medals past the Cenotaph in Whitehall. Such huge crowds, such cheering and waving of flags, way more than last year. It’s unlikely one will see another mass of humanity in London SW1, unless there’s another conflict – God forbid. In Horseguards Parade beforehand one met numerous people. 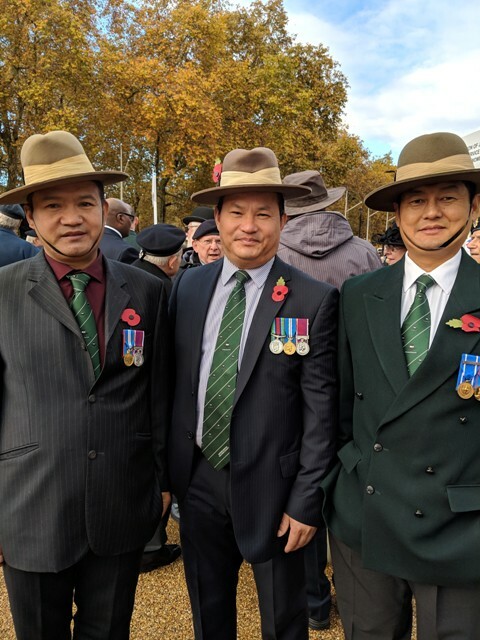 Some from The First Aid Nursing Yeomanry (Princess Royal’s Volunteer Corps) or the FANY’s, others like the Ghurkas (see photo) and a few ex-servicemen from the British Nuclear Test Veteran’s Association. One of their number explained to me how he saw his finger bones through closed eyelids when the first white flash happened on Christmas Island in 1957. He was just 35 miles away.